WTB’s marketing department kindly sent Gravel Cyclist a pair of the Horizon 650b x 47mm tyres for review. 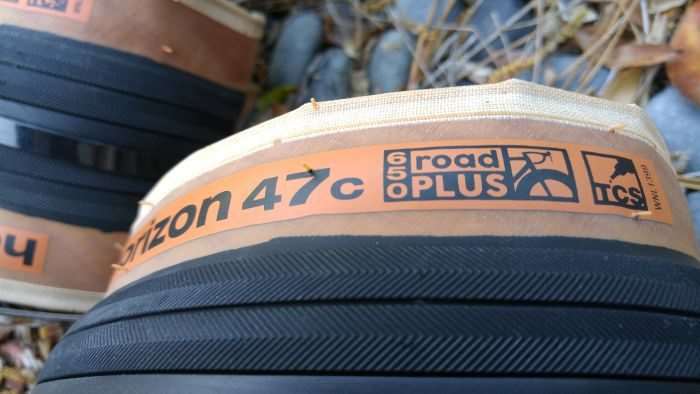 As the sidewall implies, the WTB Horizon tyre is available in one size only – 650b (aka 27.5″) x 47mm (aka 1.8″) wide – and is marketed as a road tyre, namely under WTB’s “Road Plus” nomenclature. 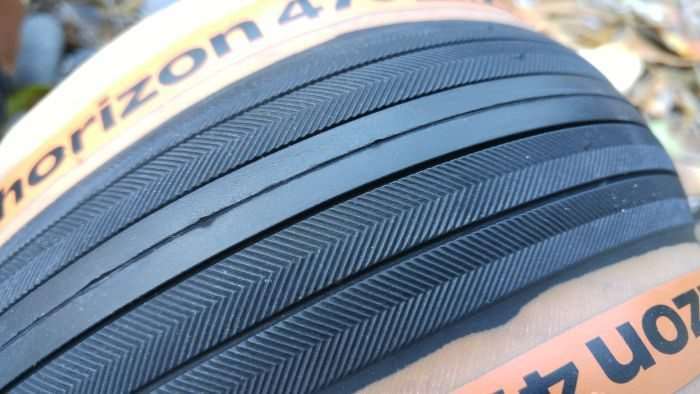 As highlighted in the previous paragraph, the overall diameter of the Horizon 650b x 47mm tyre remains nearly the same as a 700c x 28mm road tyre. Provided you have the frame clearance, this tyre can squeeze into a gravel bike that would ordinarily accept a 700c x 40mm tyre. However, clearance is going to depend on a frame by frame basis, as not all frames are compatible with a tyre of this volume. Be sure to check WTB’s frame compatibility list before you purchase. 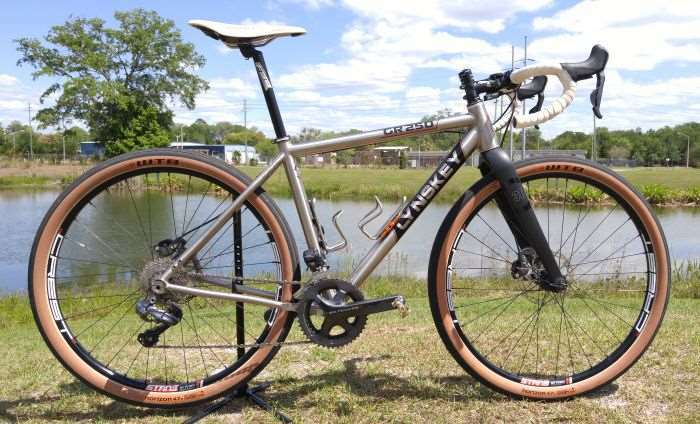 The Horizon 47’s fit no worries at all into one of our current review bikes, the Lynskey GR250 Titanium gravel bike. WTB, please add this frame to your compatibility list! 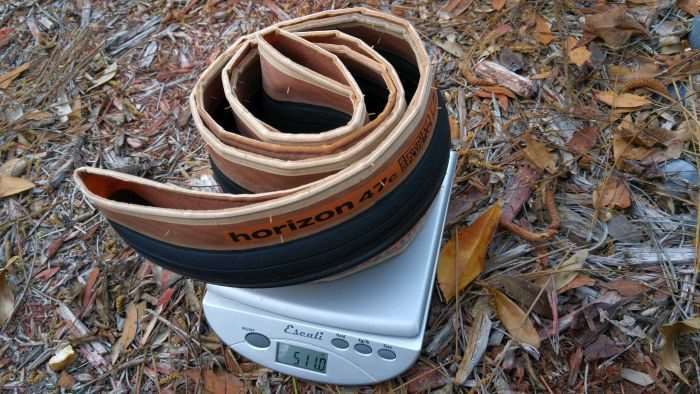 The sample Horizon tyres weighed 511 and 513 grams respectively, a little under the specified weight of 515 grams from the manufacturer. That’s always a nice bonus. The Horizon tyres feature WTB’s TCS (tubeless compatible system) with an Aramid tyre bead. As TCS is a “system”, that also includes items such as rim tape, valves and sealant. TCS is designed to make tubeless tyre setup an easy process, and that rang true during my install. The test sample Horizon tyres mounted with a minimum of fuss using Bontrager’s TLR Flash Charger pump, WTB’s valves (I also used Notubes and American Classic valves) and Orange Seal’s Endurance Formula Sealant. 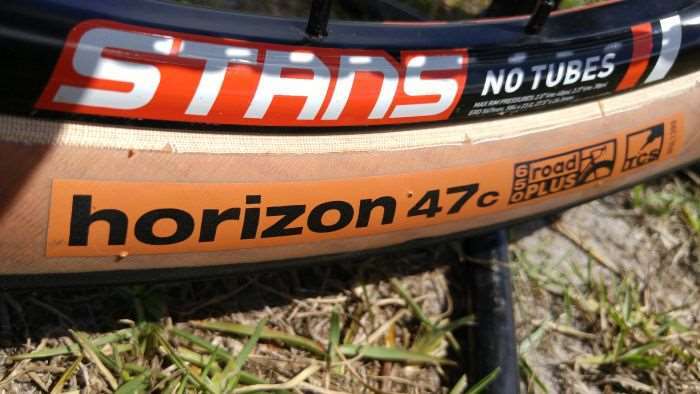 During the review period, the Horizon tyres were mounted to a Stan’s Notubes.com Crest 650b wheelset and American Classic’s Wide Lightning 650b wheelset. Always dry mount a tyre first sans sealant, to ensure it will seat and hold air. That can save making a big mess and losing a bunch of sealant. Remove the valve core and inflate. This process allows a greater volume of air into the tyre and most times, will pop the tyre onto the bead. If this doesn’t work, apply something like Sleek Beeswax & Mink Oil Furniture Polish to the sidewall. This product is far better than soap and water, and will help seat even the most stubborn of tyres. 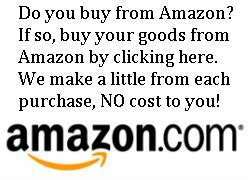 This product can be purchased from your local furniture store or online. Once the dry mount test has been passed, install your favourite sealant and inflate. Don’t forget to keep a fingertip over the valve if you removed the core. This simple step will retain the air you just inflated; if you’re good at juggling, you can quickly re-install the valve core and still keep some air inside the tyre. Then, inflate to the desired pressure. WTB’s Horizon 650b tyres add a touch of class to the Lynskey GR250. Do the WTB Horizon 650b 47mm tyres measure up? The Horizons measured 48mm mounted to the Stan’s Notubes Crest 650b wheelset (21mm internal), and a portly 52mm on the American Classic Classic Wide Lightning 650b wheelset (29.3mm internal). Both wheelsets are MTB wheelsets and increase the width of the Horizon tyres nicely, and for free! Additional tyre width is always a good thing. 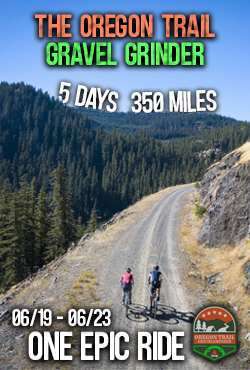 As is the norm around here at Gravel Cyclist, I rode the Horizon’s a little out of their comfort zone. The tread pattern of the Horizon is conducive to reasonably fast pavement riding, and does very well on rough paved road surfaces. In fact, it turned the Lynskey GR250 review bike into a boulevard cruiser, shrugging off bumps or potholes in the road. The Horizons simply make bumps feel plush. 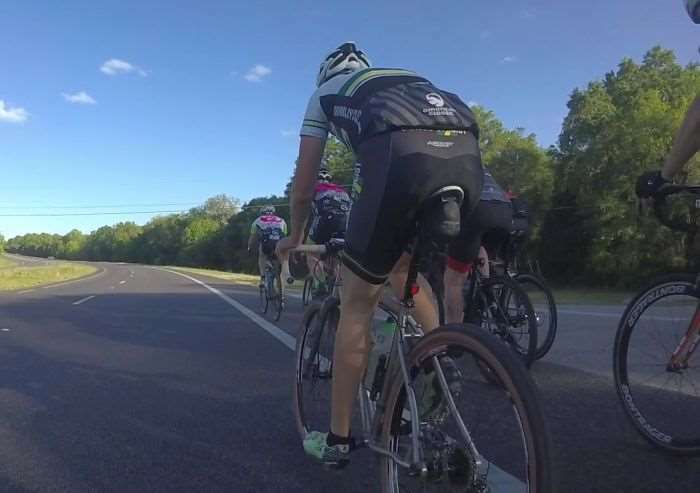 To further test how well the Horizons fare on paved roads at speed, I took them and the Lynskey GR250 gravel review bike to a couple of roadie rides, including a rapido Tuesday night ride in Gainesville, Florida known as the “Rouleur” ride. JOM on the Lynskey GR250 & WTB Horizon’s. 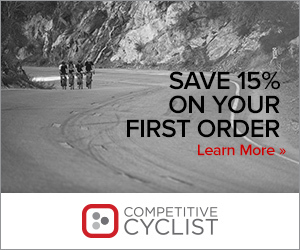 Early into a fast roadie ride. Photo by Josh Berry. Max speed on that ride was 58km/hr / 36mph. I definitely suffered but hung in there. WTB Horizons on a mellow roadie ride. 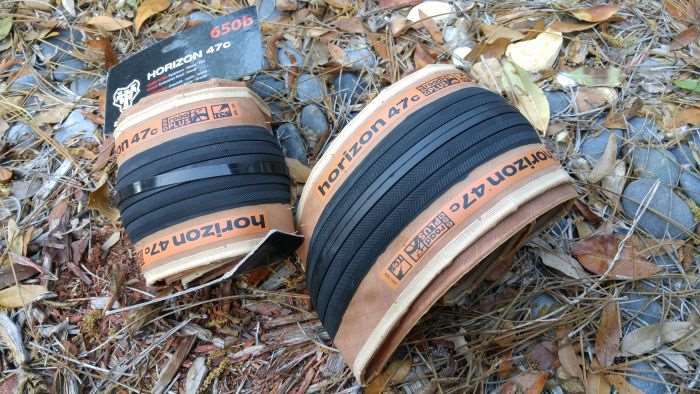 In the defense of the Horizon tyres, they aren’t really meant for hammering on roadie group rides, but if you’re strong enough to push them, it can be done. They are much better suited to cruisier speeds and really do well at around 18mph / 30km/hr. They take a little effort to get up to speed, but the smooth center tread of the Horizons is good for all round riding, and the herringbone pattern on the edges is confidence inspiring during cornering on pavement. But, you’re probably not reading this review to see how well the Horizons perform on pavement? So, I put them to the test on some long gravel rides. Firstly, the pressure was dropped to 30psi front and 32psi rear to make the ride even more comfy on the bumps you come to expect with dirt and gravel roads. It is important to note that WTB recommend inflating to between 35psi and 55psi with this tyre. Because the Horizon is essentially a mountain bike tyre with no tread knobs, it was logical to me to inflate it closer to mountain bike pressures on gravel. Surprisingly, the Horizons did very well on just about every dirt and road that I traversed. The big volume of these tyres simply steamrolled over bumps and tracked nicely on loose gravel surfaces. They aren’t the sort of tyre you can rail hard into a loose gravel corner, but that isn’t something I recommend anyway. They do corner well, but take it easy. Even with tyre pressure set lower than the manufacturer’s stated recommendations, I experienced no burping or loss of air. Lighter weight riders could try experimenting with lower pressure, but for a rider of my weight (155lbs – 158lbs), I’d recommend 30psi as your low number. 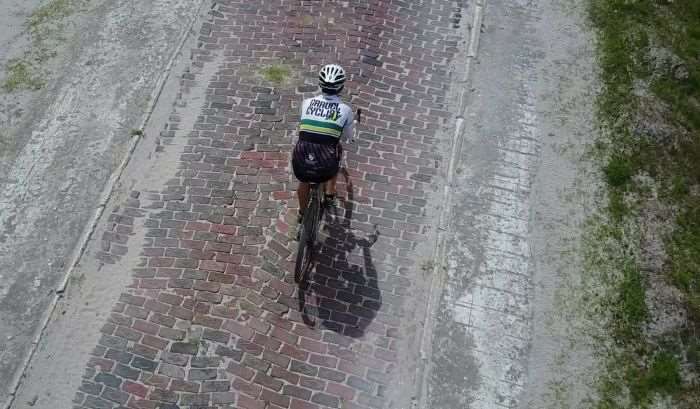 This historic brick road in Florida didn’t faze the Horizons. 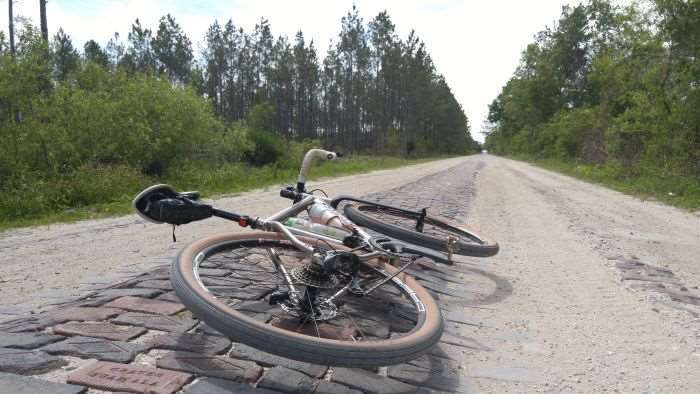 In the photo above, a historic brick road in Florida, the Horizons simply gobbled up the sometimes jarring, bumpy and uneven surface. Even along the nastiest sections of this road, the Horizons simply floated over the bumps, providing a Cadillac like ride. These would be fantastic tyres to smash across the cobblestones of Northern France! Flying across this historic Florida brick road. The Horizons can break loose a little under power on a climb while a rider is stomping it out of the saddle, but overall, the performance of these tyres is impressive. Even in deep sand, something I encountered during a recent weekend ride, the Horizons floated on through. Such are the advantages of a wide tyre. Riders aboard 40mm wide tyres would have been sinking and floundering. The sidewalls of the Horizon are a little thin which could be a weakness in rocky terrain or flinty gravel, the type you’d see in the hills of Kansas. But, I am thankful to say that no tyre punctures were experienced during the review period. 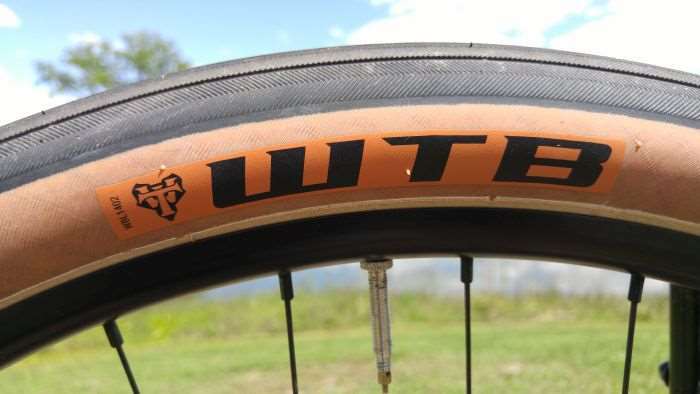 The WTB Horizon 650b tyre is a great performer on pavement and gravel, and the smaller wheel / tyre size provides an option for those who own frames with limited tyre clearance to possibly experience wider tyres on gravel – don’t forget to consult WTB’s frame compatibility list before buying. The Horizon is a great choice for a rider who commutes a few miles / kilometres in order to reach their local gravel road(s). Not exactly designed for high-speed cornering with its lack of tread blocks on the sides, the Horizon still does well enough on just about every dirt and gravel road surface imaginable. However, as stated earlier, it isn’t a tyre I’d consider for the flinty rigours of an event like Dirty Kanza. The WTB Horizon 650b tyres have an MSRP of $67.95, but can be found a little cheaper depending on where you buy. The frame compatibility list is not to be trusted. This tire does not fit the Cannondale Slate with the rims that come with that bike. I did leave the front tire on and it does not hold air. I can get a ride in with no noticeable loss of pressure but the next day you will need to inflate. I think I have about 5 oz of Stans in that right now. It does perform nicely on gravel as long as you don’t hit any wet mud spots. That is a bummer to hear about the Slate. I’ve seen a few of them in person and I figured that big tyre clearance would be an issue with some tyres. That is the one issue with a bike that is dedicated to the 650B wheelsize. Re: holding air, have you checked the tape around the valve? Or, I am assuming you’ve done the usual shake routine, then place the wheel face down on a bucket, etc, let it sit about 10 minutes, then repeat and place onto the bucket on the other side of the wheel? I’ve had tricky tyres in the past take about two days of messing about with to settle down. I think the compatibility list is primarily for frame clearance, not for how these tires work with the spec’ed rims. Spec changes year to year, not necessarily the frame itself. That’s a definite AK_Ben, although wider rims add a little width to some tyres. So many factors to think about. A couple weeks ago I took my first ride on my Horizon setup and had the exact same feelings as you. I took off riding road and I couldn’t get past how sluggish they felt. 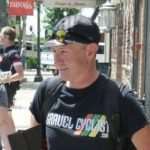 I got into some out of the saddle road climbs and actually got bummed. I then took them to dirt and I got stoked. Such a plush comfy ride and truly enjoyable. I got back out on the road after a bit and with a changed perspective of what they were designed for and I had a blast. So as long as you are able to turn off ‘race mode’, they are amazing and super versatile. 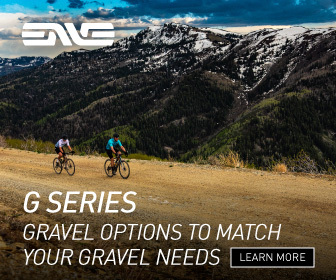 They’re also great for riding with your slower friends… they take their roadies, you take the gravel bike with Horizons and you have a nice ‘no drop’ ride. Haha. Nicely put! Check out the new WTB Byway 650b tyre, just released! I have samples and will be riding them pronto. Dude… Just saw them and I think they would work better for me and the way I like to ride compared to the Horizons. I run Exposure 34s on my 700 setup and they are such wonderful tires. These new Byways are basically a 650b version of those in my opinion. I must have them! Haha. I don’t want to spoil the review, but I believe that is a no. They don’t hold air for me with the actual WTB KOM i23 recommended rims. That’s with Stans. The Exposure 34 I did think was awesome. I have been experimenting with broken road and dirt road riding with tires from 32mm to 60mm. 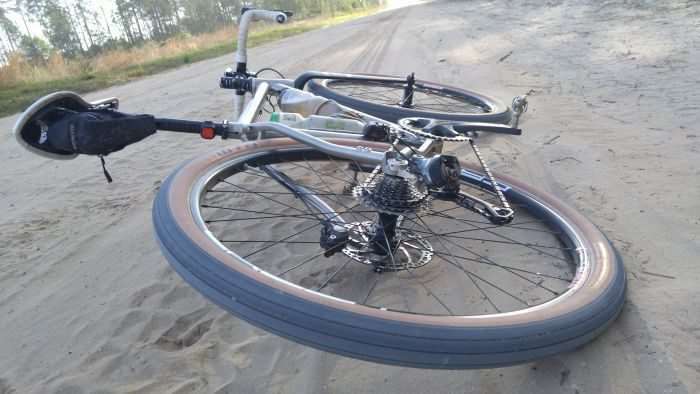 The 32mm tires still worry me regarding pinch flats on the common golf-ball sized stones of dirt roads and they are harsh on broken or patched pavement. 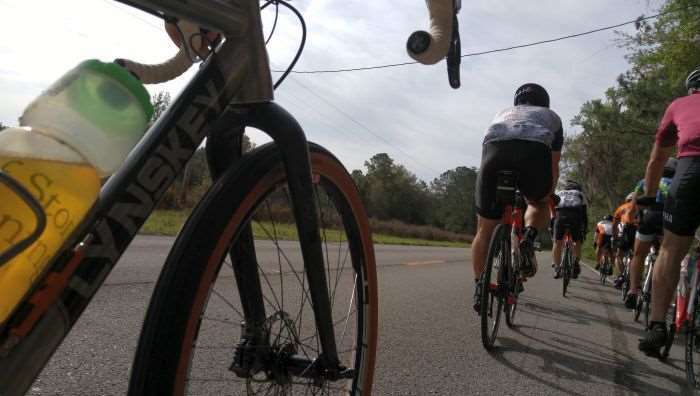 When going to the 50-60mm tires the loss of lateral stiffness makes the same trouble as an overly flexible rear triangle and fork. 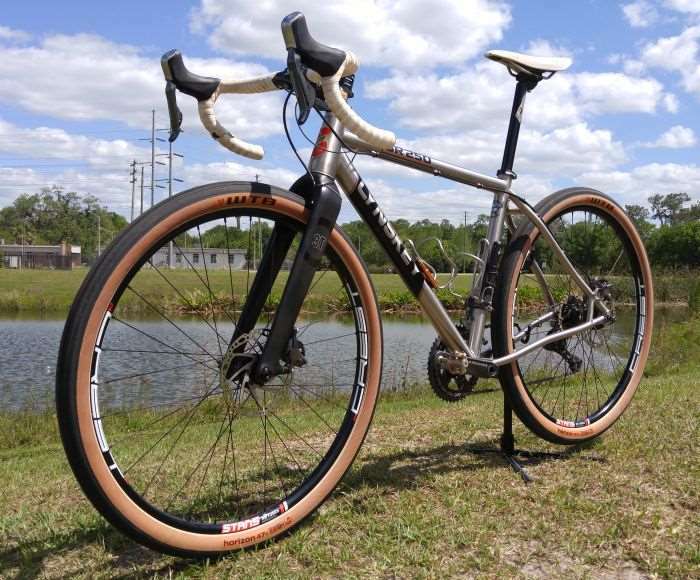 It seems that a bike with a 50mm travel suspension that is preloaded to be topped out against the rebound limit colud provide relief from jarring rocks an typical road/dirt bumps and alow 32mm tires to deflect without pinch flats. Meanwhile the majority of times, the topped out suspension could provide road bike style stiffness and efficiency.